I need to knit *how many* dishcloths????!!! Yep, you read that right. I made my goal!! I actually beat my goal of $500 by $55. YAY!! 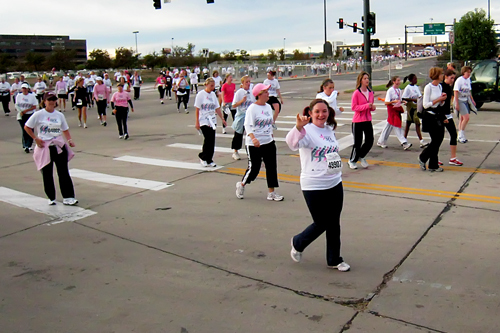 I am very grateful to those who donated to support my participation in the Denver Komen Race for the Cure. I am also grateful for all of the moral support I received. I could not have done it without *all* of you!! Due to all of the fantastic support, I have 15 dishcloths to make. 15!! I can’t tell you how much that makes my heart sing. And so far, I have 4 1/2 made….only 10 1/2 to go!! So, if you are on my list, know that I am knitting like a fool and will get those goodies out to all of you soon!! On to the good stuff! Pictures!! 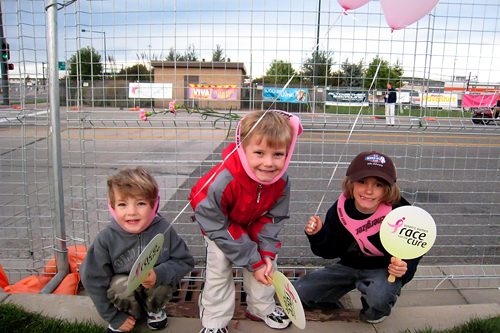 Wade and the boys went to the race with me this year, and I am so glad they did. They had a good time, despite the early wake up call. Wade took this picture of me almost at the start line. This is a sign that pointed in the direction of the start of the race. We actually started on the Speer bridge crossing I-25, so I had to walk a block or so from this spot. Still, it seemed like a good place to take a picture and give hugs and kisses to the boys. 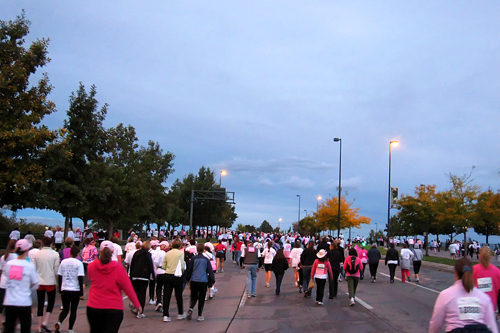 A picture looking toward the start line… I love seeing all of those women in pink! Wade took the boys to the finish line (or as close as he could get to it) to wait for me. The boys got all kinds of swag from the vendors at the race. They were in swag heaven! And finally…the reason I run. My friend Stef is the reason I began this journey last year. 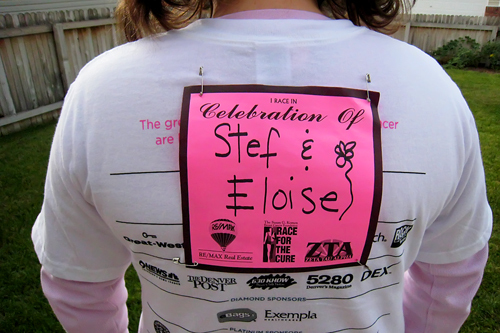 And this year I found out that my ‘Aunt’ Eloise has breast cancer. This wonderful woman is one of my grandmother’s greatest friends. She has lived a long and wonderful life, and it is just not fair that this has happened to her. 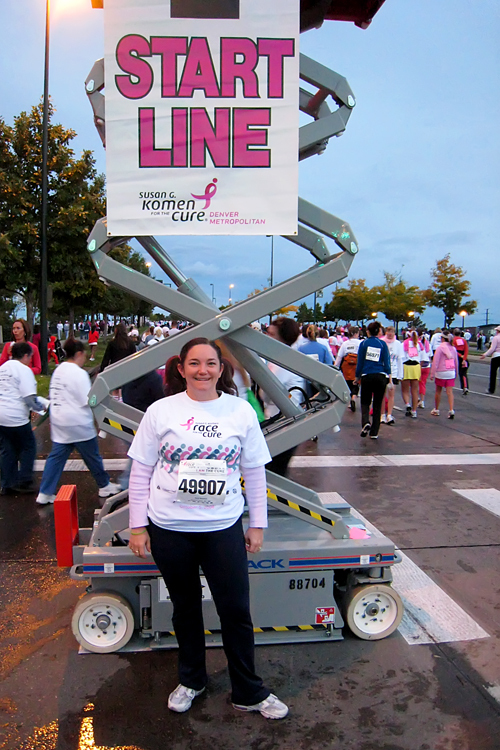 It is just not fair that breast cancer has to happen to anyone. And that is why I run. So that one day it never has to happen to anyone. Ever again. Thank you from the bottom of my heart. For your support. Moral and monetary. Thank you. Go, YOU! I’m so proud of you. It would take me 133 minutes. Seriously. Woo-hoo, Heather! How awesome that you did this AND that you beat your time from last year! We were so glad to hear you reached your goal! Awesome effort for a really great cause. i love seeing these pictures in big time view. wow! i’m so proud of you! what a great thing to do. have fun knitting. Glad to see you aren’t too busy to exhibit some of that Tyler wit. By the time you are through with all of this knitting you will be our favorite “Knit Wit”.